In an earlier post, I suggested that rural citizens might use more energy than urban citizens, one reason being that on average they have to drive farther to get between places. 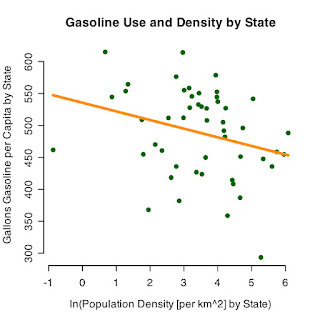 To get an initial handle on this claim, I compared per capita gasoline use to population density by state. The graph below depicts the relationship with a linear regression that is statistically significant, barely. I did not include Washington D.C. because it's population density is well outside the range of all other states and skewed the data, though in the favor of the result from the other 50 states. What does this mean? Not a whole lot. First of all, correlation is not causation. Densely populated states contain more urban areas, which tend to elect Democrats, who might be more liable to enact energy saving laws. However, that would not explain why states like Arizona, Pennsylvania, and Colorado are among the least in gasoline consumption, or why Maine and Iowa are among the most. Secondly, the weak correlation indicates that other factors are important, such as policy, geography, and the distribution of people. Finally, gasoline is consumed for other purposes than driving, but my guess is that driving accounts for most of it. Nonetheless, it is suggestive that even a coarse-grained analysis reveals a signicant correlation between population density and gasoline use.